Originally, we were going to stay in the Black Hills until Tues., but we didn't think we'd have quite the time in Colorado that we wanted. We ended up leaving on Monday, driving to Steamboat Springs, and setting up camp. Getting there was quite the adventure. At first, the scenery was nice to look at. But then, it got a little old...just about the time the wind kicked up. Seriously, I'll take the drive through Mississippi any day over the drive through SE Wyoming. When we stopped for lunch, I asked the girl if it was always that windy, and she said that it was much worse the night before. How do those people live there??? After getting out of the wind (finally!) and past the forest fire (sorry, no picture of the smoke! ), we made it to Colorado. It wasn't quite what I was expecting, but pretty just the same! CH reserved our campsite for us at a campground he stayed at when he rode the Continental Divide on his motorcycle. He couldn't have picked a prettier spot. 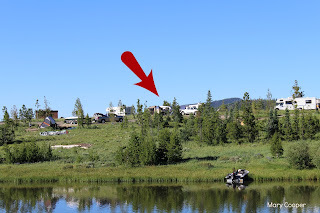 We stayed at Steamboat Lake State Park, about 30 minutes from Steamboat Springs. 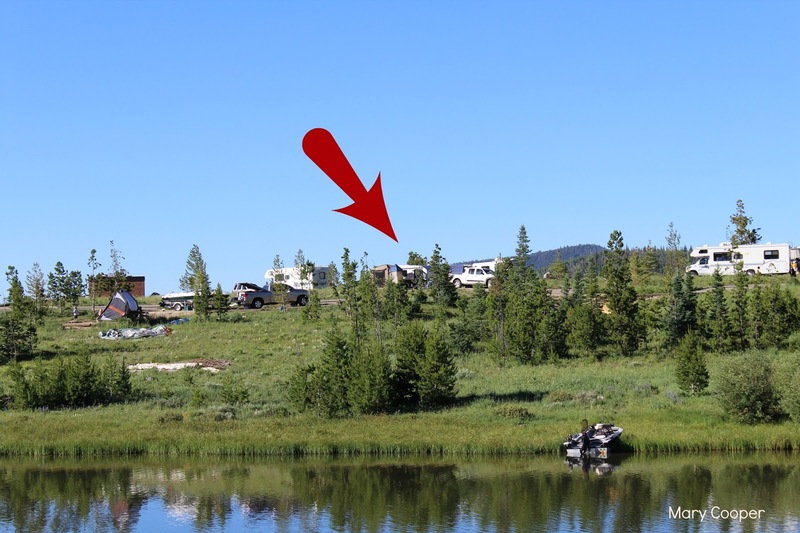 Our site was on the island section of the campground. During my first visit to the potty (it wasn't flushable! ), I saw a lot of little holes. I asked CH what they were, and he said they're chipmunk holes. WHEW! My first thought was that they were snake holes! They provided us with a lot of entertainment! It was a very relaxing couple of days. The first morning, there was frost on the ground. In July. We drove back into Steamboat Springs to grab some groceries to last us for a couple of days and get some lunch while we were in town. The town reminded me a lot of Asheville, NC. The place where we ate was okay, nothing to write home about. We had a good time relaxing, talking, and taking a hike. I didn't take my camera with me on the hike, but the main attraction was the fields of flowers around the lake. They were just gorgeous. And the flowers were everywhere. Hahn's Peak was always in sight. CH talked to someone whose daughter & son-in-law snowmobiled up as far as they could, hiked the rest of the way, then skied down one winter. We could tell there was something at the top; we found out it's a fire tower. After a couple of days in Colorado, it was time to head back to East Tennessee. Our friends, if you'll remember, are on their way to an adventure in Mexico and South America. They just happen to have a blog! John is quite the photographer, so you'll see some incredible pictures. I have a few more pictures from the trip home; I hope to have them up in the next couple of days. Great photos and those sunsets are absolutely gorgeous and so BIG when compared to sunsets over the Gulf. I'm going to check out your friend's blog and will look forward to your trip home photos later this week! Love all the beautiful pictures. So glad you made it to Colorado. Glad you had some very relaxing days!